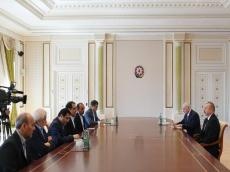 President of the Republic of Azerbaijan Ilham Aliyev has received a delegation led by Minister of Health and Medical Education of the Islamic Republic of Iran Hassan Ghazizadeh Hashemi. Iranian Minister Hassan Ghazizadeh Hashemi extended President Hassan Rouhani’s greetings to President Ilham Aliyev. He noted that thanks to the combined efforts of Azerbaijani President Ilham Aliyev and Iranian President Hassan Rouhani the bilateral relations between the two countries are developing and strengthening day by day. The head of state hailed the successful development of bilateral relations between Azerbaijan and Iran in all areas, including healthcare. President Ilham Aliyev recalled his meetings with President Hassan Rouhani. He noted that during these meetings the issues relating to healthcare cooperation were discussed and relevant instructions regarding the implementation of works in this area were given. The head of state expressed his confidence that the Iranian minister’s visit to Azerbaijan will contribute to the expansion of cooperation between the two countries in the field of healthcare. President Ilham Aliyev thanked for President Hassan Rouhani’s greetings and asked the minister to extend his greetings to the Iranian President.